PINCKNEY, Mich. - A four-hour drive north of metro Detroit takes you to northern Michigan, which is arguably the best spot for summer golf in America. 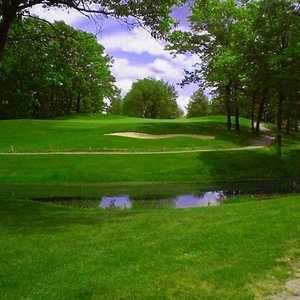 The tall pines at Timber Trace Golf Club are reminiscent of northern Michigan courses. Take a photo tour of Timber Trace G.C. But back in Pinckney, a small village just past the outskirts of the Detroit suburbs in Livingston County, is Timber Trace Golf Club: a facility featuring a lot of qualities likened to a round up north. That includes good conditions, off-course amenities, forgiving fairways and a layout that doesn't require several plays before you find out how to approach the holes. When it first opened in 1998, several temporary greens and other greens that were spotty kept it from making a big splash, but from the beginning, there was a buzz in the area this course could become something above and beyond the scores of decent courses in the area. Seven years later the greens are smooth and fast and Timber Trace is becoming an area favorite. "(Timber Trace) is certainly desirable by the public," said Trent Smith, head professional and general manager at Timber Trace. "We have a good staff, service, quality, design and conditions. It's definitely consistent across the board." Timber Trace is extremely playable for any skill level and low-handicappers can get in the red if their short-iron game is on. There are five sets of tees and you can see about everything from tee to green on every hole. "It's very generous from the tee," Smith said. "You have to hit a pretty errant drive to get in any trouble. But approach shots must be very precise." Approach shots certainly make up for the driver's generosity here. Most greens are smaller than your typical modern course and are heavily bunkered. Many times, pin placements play to the right or left of a bunker placed in front. This also means that the side of the fairway your drive ends up on could make the approach trickier. Smith said it's never too early to check out the pin placements. "From the tee, you should be looking at the pin," Smith said. "If we tuck them, it's tough to get there if you aren't in the right spot (on the approach)." One of the course's best driving holes is the par-5 15th, which is one of the widest fairways on the course. The dogleg left can also be cut off considerably and if you spray it right, you end up in fine position anyways. There are also two opportunities to drive the green on the backside. The 298-yard 11th is guarded only by a couple not-so-intimidating bunkers and the 330-yard 13th's green is slightly elevated and shallow, so it's best to leave it 40 or 50 yards short. However, Smith admits that being able to use the driver on every par 4 and par 5 is what he likes best. "As a player, I like the generous tee ball here," he said. "People spend so much money on drivers these days, you can hit it on 14 holes." The variety of land makes for two kinds of hole settings at Timber Trace. 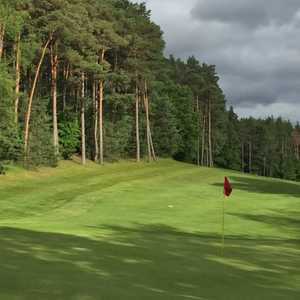 First, there's the heavily-wooded, timber holes of which the course gets its name. These holes (Nos. 1-5, plus 17 and 18) set the stage and are shaded with tall timbers on both sides. The majority of the holes are wide open, with sweeping heather on both sides. Water is an afterthought, coming into play rarely, but most notably on the approach to the 10th green. The golf course winds through the Putnam Meadows development, which was built at the same time as the course, but isn't affiliated with Timber Trace. At certain points, especially near tee boxes, homes get a little close to the action (one back yard even features a welcoming stone walking path right up to the tee), but most often homes keep their distance. There are few parallel holes, so most present their own stage and golfers can have a little alone time with each one. Smith said Timber Trace is one of the top three courses (Moose Ridge and Majestic being the other two) within a 25-mile radius. The area draws golfers from Ann Arbor-Ypsi, suburban Detroit and Lansing areas. Golf cars are mandatory at Timber Trace, due largely to the five-minute drive between the 12th and 13th holes and again between No. 16 and No. 17. The drive rolls through the wetlands of the Lake Wallaby Nature Area, which is owned by a farmer and takes you to what feels like a totally different world once you emerge at the 13th tee. The long drive gets mixed opinions at Timber Trace. "It's something people remember us by," Smith said. "I'd say it's probably 70-30, good-bad. People who come from the city love it - they're used to seeing concrete all over." Timber Trace hosts many junior tournaments. During those events, shuttles bus players back and forth through the preserve. 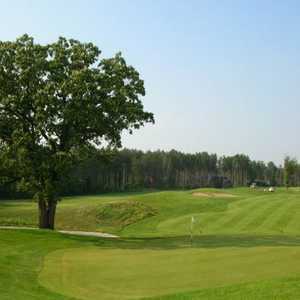 Timber Trace offers a little bit of northern Michigan at a great value. The golf course is extremely playable for all skill levels, although sharpshooters may wish for a little more challenge or variety off the tee. The course is in great shape this summer as well. Consistency is what makes Timber Trace. In terms of layout, service, quality and conditioning, there's no weak point.